Institut Lumière Matière. Université Lyon 1/CNRS. Villeurbanne. France. Bouteau, G.; Van-Nhien, A. N.; Sliwa, M.; Sergent, N.; Lepretre, J.-C.; Gachot, G.; Sagaidak, I.; Sauvage, F.
Scientific Reports 2019, 9, 135. Combining energy conversion and storage at a device and/or at a molecular level constitutes a new research field raising interest. This work aims at investigating how prolonged standard light exposure (A.M. 1.5G) interacts with conventional batteries electrolyte, commonly used in the photo-assisted or photo-rechargeable batteries, based on 1 mol.L−1 LiPF6 EC/DMC electrolyte. We demonstrate the intrinsic chemical robustness of this class of electrolyte in absence of any photo-electrodes. However, based on different steady-state and time-resolved spectroscopic techniques, it is for the first time highlighted that the solvation of lithium and hexafluorophosphate ions by the carbonates are modified by light exposure leading to absorbance and ionic conductivity modifications without detrimental effects onto the electrochemical properties. Omri, M.; Sauvage, F.; Golonu, S.; Wadouachi, A.; Pourceau, G.
In the growing context of sustainable chemistry, one of the challenges of organic chemists is to develop efficient and environmentally friendly methods for the synthesis of high-added-value products. Heterogeneous photocatalytic transformations have brought revolution in this regard, as they take advantage of an unlimited source of energy (solar light) or artificial UV light to onset organic chemical modifications. The abundance of free carbohydrates as chemical platform feedstock offers a great opportunity to obtain a variety of industrial interest compounds from biomass. Due to their chirality and polyfunctionality, the conversion of sugars generally requires multi-step protocols with protection/deprotection steps and hazardous chemical needs. In this context, several selective and eco-friendly methodologies are currently under development. This review presents a state of art of the recent accomplishments concerning the use of photocatalysts for the transformation and valorization of free carbohydrates. It discusses the approaches leading to the selective oxidation of free sugars, their degradation into organic chemicals, or their use for hydrogen production. Omri, M.; Becuwe, M.; Davoisne, C.; Pourceau, G.; Wadouachi, A.
J. Colloid Interface Sci. 2019, 536, 526-535. A new series of supported organocatalysts, prepared by a simple method, were used for selective sugar oxidation. This approach is based on the immobilization of a nitroxide derivative through a carboxylic function on nanometric metal oxides (TiO2, Al2O3 and CeO2), allowing the recovery of the catalyst. These hybrid materials were carefully characterized by Diffuse Reflectance FT-IR spectroscopy (DRIFT), ThermoGravimetric Analysis (TGA), X-Ray Diffraction (XRD), Brunauer-Emmet-Teller surface area measurements (B.E.T. ), elemental and electrochemical analyses, showing different characteristics and behaviors depending on the nature of the metal oxide used. The activity of the supported nitroxide catalyst was evaluated on methyl α-d-glucoside oxidation, used as model reaction. In all cases, high catalytic activity was highlighted, with up to 25 times less nitroxyl radical required for complete conversion than under homogeneous conditions. The influence of several experimental conditions such as the use of phosphate buffer and recyclability of the catalyst were also investigated. Beaulieu, R.; Grand, E.; Stasik, I.; Attoumbre, J.; Chesnais, Q.; Gobert, V.; Ameline, A.; Giordanengo, P.; Kovensky, J.
Pest Manag Sci 2018, 0. Potato (Solanum tuberosum) is the fourth culture in the world and is widely used in the agri-food industries. They generate by-products where alpha-chaconine and alpha-solanine, the two major solanidine based glycoalkaloids of potato, are present. As secondary metabolites, they play an important role in the protecting system of potato and are involved in plant protection against insects. To add value to these by-products, we described herein new glycoalkaloids that could have phytosanitary properties. RESULTS: Solanidine, as a renewable source, was modified with an azido linker and coupled by Copper catalyzed alkyne azide cycloaddition (CuAAC) to alkynyl derivatives of the monosaccharides found in the natural potato glycoalkakoids: D-glucose, D-galactose and L-rhamnose. The efficacy of our compounds was evaluated on the potato aphid Macrosiphum euphorbiae. The synthetic compounds have stronger aphicidal properties against nymphs than unmodified solanidine. They also showed strong aphicidal activities on adults and a negative impact on fecundity. CONCLUSION: Our synthetic neoglycoalkaloids affected Macrosiphum euphorbiae survival at the nymphal stage as well as at the adult stage. Furthermore, they induced a decrease of fecundity. Our results show that chemical modifications of by-products may afford new sustainable compounds for crop and plant protection. This article is protected by copyright. All rights reserved. Ahmed, A.; Chaker, Y.; Belarbi, E. H.; Abbas, O.; Chotard, J. N.; Abassi, H. B.; Van Nhien, A. N.; El Hadri, M.; Bresson, S.
J. Mol. Struct. 2018, 1173, 653-664. 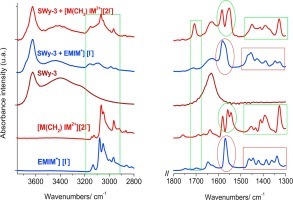 Three different montmorillonites (Mts) labeled K10, KSF and SWy-3 were analyzed by X-ray diffraction and ATR/FTIR spectroscopy. The XRD results enabled validation of the purification process of the studied clays. In the spectral regions 3800–2600 and 1800-1300 cm-1, the study of different intensity ratios of peaks assigned to the OH bending and stretching modes displayed the specific vibrational behavior of SWy-3 which is certainly influenced by a greater proportion of Na+ in its structure. Before analyzing the clays modified by ionic liquids, we characterized two imidazolium based ionic liquids (ILs) with anion I-: [EMIM+] [I−] monocationic ionic liquid and [M(CH₂) IM2+] [2I−] dicationic ionic liquid. The passage from [EMIM+] [I−] to [M(CH₂) IM2+] [2I−] reveals significant vibrational changes through various modes: ν(NH), rings ν(CC), rings ν(CN), ν(CH2(N)), ν(CH3(N)) in addition to anion interaction modes. When purified, these ionic liquids modify clays, the XRD analysis shows that the studied modified clays exhibited higher d-value increase with respect to the purified Mts, and the reflection peaks 2θ (°) of plane (001) were displaced towards lower values as a consequence of the ionic liquid intercalation process. ATR/FTIR spectra recorded in the spectral zone 4000-600 cm-1 indicated the appearance of new peaks and a significant intensity variation between clays in relation to the type of chosen ionic liquid. These vibrational changes are directly connected to the presence of ionic liquids in clays. XRD and ATR/FTIR investigations show a stronger effect of the [M(CH2) IM2+] [2I−] dicationic ionic liquid on the Mts than the monocationic ionic liquid and the SWy-3 Mt is more sensitive to monocationic and dicationic ionic liquids than K10 and KSF Mts.